33200.0010 VPR-APS Pourover Airpot Coffee Brewer with 1320 watt tank heater. Stainless steel and black finish and plastic funnel with SplashGard. Brews into (1) 1.9 to 3 liter airpot, (shown and sold separately). Stainless steel and black finish. UL, NSF listed. 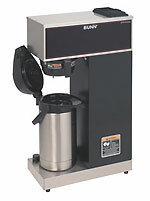 Brews 3.8 gallons (14.4 litres) of perfect coffee per hour. Internal components are constructed from stainless steel. Pourover brewer requires no plumbing - completely portable. Just pour cold water in top and coffee brews immediately. Accommodates 1.9 to 3 litre airpots. Convenient airpot keeps coffee hot and fresh for hours. Airpots are easily transported to remote meeting rooms, breakfast bars, etc. Integral part of any office coffee service program.